188/365(+1), a photo by Luca Rossini on Flickr. The soil of Monte Argentario has always been rich and productive. Its very name was given by the Romans due to the silver-ish color of the hill when the sun hit the leaves, that swong at the breeze, of the thousands of olive trees already covering the island. Since my parents bought the summer house, we produced lot of succulent fruit (much more than we could possibly eat or share). At first we had peaches, yellow round plums, blue long plums, apricots, pears, and apples. In the years we lost some of the variety, but increased in quality. A great addiction was brought, however, when my mum had a fantastic fig tree planted just in front of the entrance gate. I love figs. I really do. I love them raw, in jam, dry, covered with chocolate, stuffed with almonds or nuts, used to cook the roast, etc. 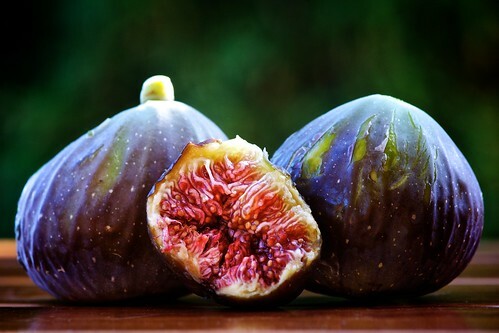 You name a sweet or any other meal that contains figs, I’m going to love it. So, having a tree that delivers a ridiculous amount of my favorite fruit everyday (and those among you who ever had the luck to eat fruit directly from the tree know how immensely more delicious they are) is so marvelous to be almost dangerous, because I have to actively remember to stop me from eating figs till I dye. I could have used a suicidal bunny to tell the story, but I left Mr. Bunny at home, so here there’s close-up of my morning pre-breakfast, directly picked from the tree, shortly after sunrise, as forced as I am to be an early bird due to Agata teething these days.